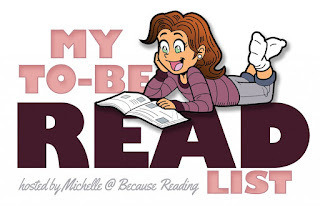 Musings of a Bookish Kitty: Sunday Post: It is Time For May's TBR Poll & Free Comic Book Day! I just finished up Glitch and Travelers on Netflix, so now I'm on the lookout for the next thing to watch. Love the bookshelf pics! And I voted for Radio Girls! Greg - My husband can find a comic store wherever he goes--or at least he tries. :-) I haven't been able to get into graphic novels on an e-reader. But then, I don't read them too often either. I haven't seen Glitch yet, but I would like to. I need to get back to Orphan Black soon! Thank you for voting! I'm really excited about all three of these books. I look forward to seeing which one wins. All three of those sound interesting, but I went with Radio Girls. Enjoy! Shaunesay - I think they all sound good too. :-) Thank you for voting and visiting today! I hope the situation improves at your work place. It is hard to face Monday when things aren't going well. I want to read No One Can Pronounce My Name. I have it on my TBR pile and hope to get to it soon. I love the title and can definitely relate. Thankfully my parents gave me an easy first name at least. LaRose sounds really good and I hope to read it with one of my book groups sometime. We read The Round House which was really great for discussion. I also want to read your historical fiction books. They all sound fascinating! Christina - Thank you for the good thoughts. I am going into work tomorrow armed with them, and am sure it will help. 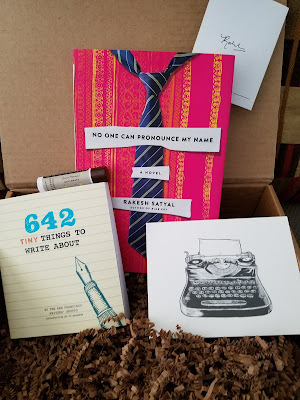 I am looking forward to reading No One Can Pronounce My Name. I think LaRose would make a great group discussion book. This is my first Erdrich book, but I definitely am interested in reading more by her. Thank you for visiting, Christina! That Lit Box is awesome. And No One Can Pronounce My Name looks good. All the historicals look good, especially Radio Girls. OMG your shelves are beautiful! 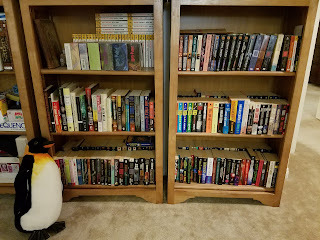 I don't rearrange mine either, I have them separated by author mostly because when I enjoy an author I tend to buy most of their books. 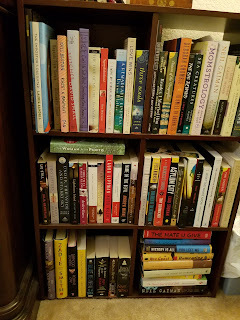 Then my ARC's and book review books are mainly separated by genre. 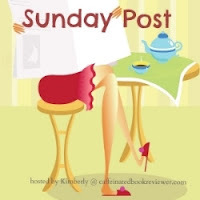 Happy Sunday and I hope work's not too hectic Monday, I can totally relate! Thank you for visiting and for the book wishes tomorrow! Oh, that was a lot of comics for free awesome. Stormi - I hadn't realized how many free comics they let a person take! My husband went a bit crazy. LOL My daughter had fun picking out her own too. It was fun. Thank you for voting, Stormi! I am still surprised I haven't read White Collar Girl yet, I remember being so excited when it first came out. Looks like it was a good Lit Box this month! Wow lots of bookshelves. 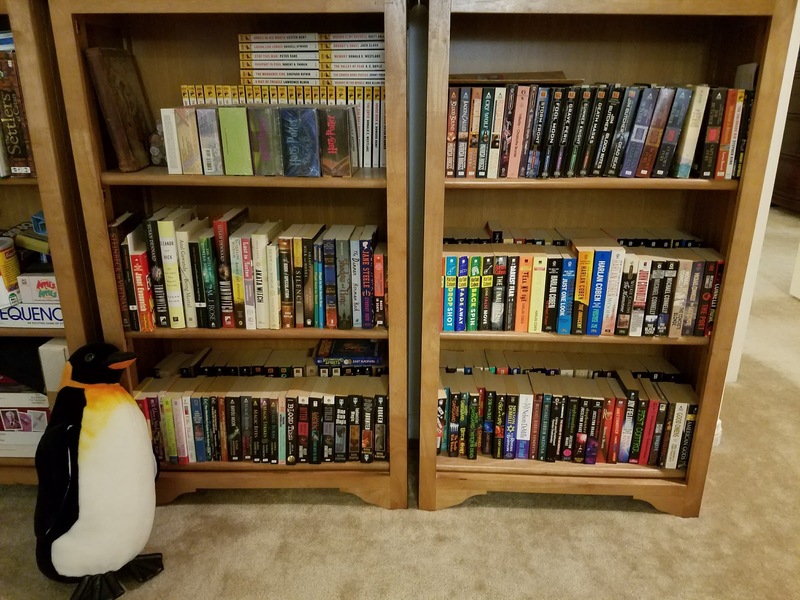 I need more - I have too many books now! I went with White Collar Girl. Have a great week! Thank you for voting, Grace! I hope you have a great week too. Thanks for stopping by. 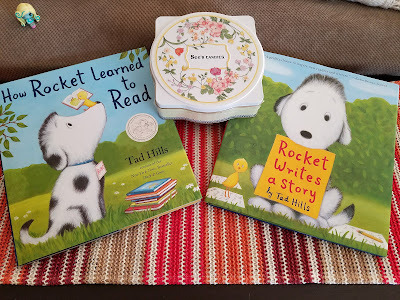 I love the Rocket books! 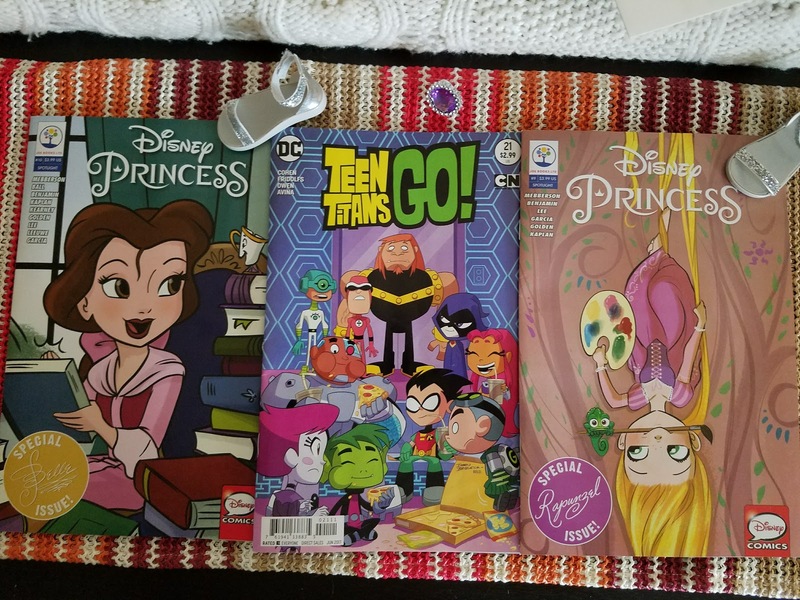 How fun that Mouse got her own selection of comics! 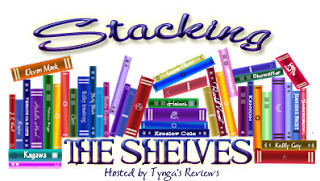 I don't rearrange my shelves either - it's too much work! Kathy - I really like the Rocket books too. :-) Especially the one about learning to read. 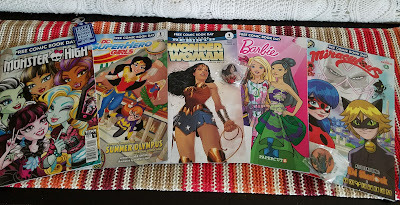 My husband has been getting Mouse into comics--she especially loves the Strawberry Shortcake ones (she didn't get any of those this weekend though). I love seeing your bookshelves! Wow! I love the idea of Free Comic Book Day! 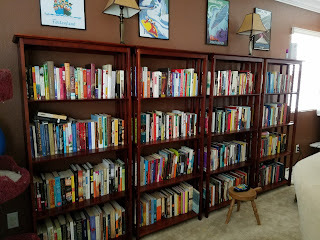 So many bookshelves, so many books :) April was a huge reading month for me, but so far, May has been pretty quiet. I've started a bunch of NetGalley books that have not worked for me and have been binge watching Korean Drama instead! 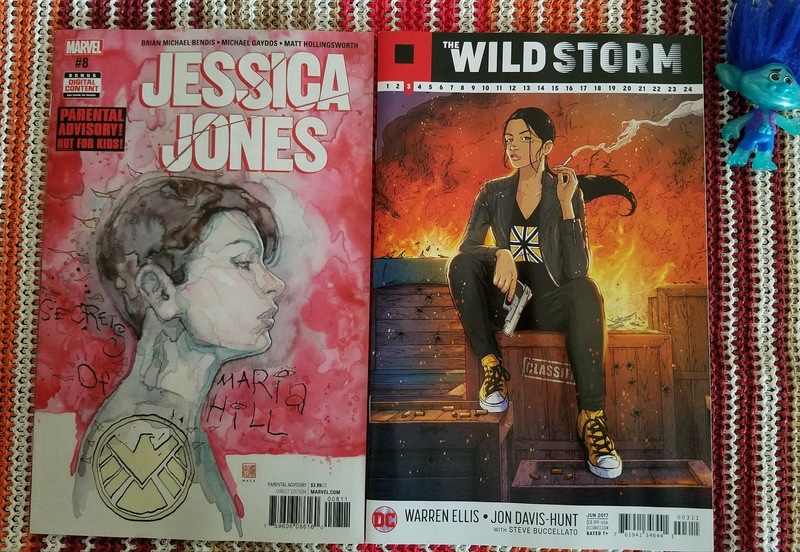 Jenclair - I guess every 1st Saturday in May is Free Comic Book Day. We don't always get to go, but I think this is the first year we came out with so many. I am sorry your current NetGalley books haven't been better for you. I've been easily distracted from my reading lately myself. I totally missed Comic book day! :( Not even sure if we have comic books stores close to us. I might need to check that out! I am voting on White Collar Girl! Love your theme this month! Thank you for voting, Michelle, and for stopping by! Enjoy whatever you pick-they all sound interesting! Bummer that work has been so hectic for you. I hate the feeling of dreading Monday. It is such a horrible feeling and it kind of puts a damper on Sundays! Hopefully this week is better. Samantha - Thank you! I think they all sound interesting too. :-) I'm trying hard not to think about tomorrow today, but it's hard. I dreamt about work last night and have a feeling that's about how tonight will go too. :-( Thank you for the good thoughts! Thank you too for stopping by! My oldest two boys were comic book collectors, and at one point, had all the Spider Man comics, even No. 1. We never had trouble deciding what to buy them. LOL. Your shelves are fabulous! So organized, they look like a library. Enjoy! I considered watching Designated Survivor, having loved West Wing and Scandal. But I haven't yet. Maybe when it ends up on Netflix, if it does? Free comic book day is cool. It was nice you sent books and chocolates. I remember doing something similar for Teacher Appreciation week. Hope you get to sneak in a little more Supernatural before things get crazy. Kim - I don't remember Teacher Appreciation week when I was growing up at all. Did they have it back then? I already have something for the teacher for the end of the year. I hope she'll like it. Thank you for visiting, Kim! Have a great week. Awww man...I really wanted to go to free comic book day! And your bookshelves look so lovely! Evelina - I couldn't decide between them either. 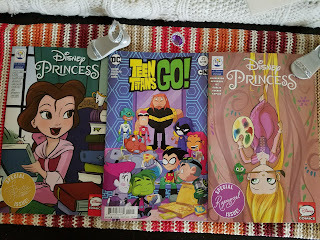 My daughter pointed to which cover she liked best. I don't think I'll cast a vote for her, but it'll be interesting to see if her choice wins. :-) Thanks for voting and for visiting today, Evelina! Radio Girls makes me think of the Spanish Netflix show Cable Girls, which I really enjoyed! I hope you'll enjoy all the books you got! Happy reading! Lynn - Thank you! I need to slow down on my book acquisitions. :-) Thanks for visiting! Nice Lit Box, Wendy! Well, I think most, if not all, of the Lit Boxes you've received so far have interesting books and other goodies in them! I really like that journal! I think your idea of using it for blog post ideas is quite original! GO FOR IT!! You know, "Teacher Appreciation Week" is also celebrated at my school. Since we have adult students, though, things are a bit different. Individual teachers don't get honored by their own class groups. In fact, this special week was not mentioned at all on the school's PA system. (Remember, I work part-time, in the evenings.) I don't know how things went for day school teachers, but I do think the day school system gives this week more "publicity". However, the night school principal did hold a special dinner last Thursday, in the school library. The librarian and her assistants decorated the place with a Hawaiian theme. She herself also welcomed the teachers and office staff at the door. She said "Aloha!" to each person, and then put a lei over each person's neck. Each lei had a small sign attached that read: "I'm a teacher. What's your superpower?" I thought that was really cute! The family comic book purchases look GREAT! Gosh, it's been ages since I read a comic book.... That was certainly a nice way to spend a Saturday afternoon, especially if there was rain on the horizon. You guys did the right thing, not taking the risk of getting drenched on the hike! Plus, of course, the trail would have gotten muddy. Yep, the comic book store was a GREAT substitute! You certainly are more organized than me, regarding your bookshelves! Heck, I'm not organized at all, lol. I do admire you organized folks, though. I sometimes can't even find a particular book I'm looking for! I picked "White Collar Girl" for your poll. I actually thought of getting a Journalism major in college at one time, so the plot definitely sounds very interesting. Plus, the cover is pretty. I was torn though, between this book and "Radio Girls". I like that cover a lot, too. It has a very prominent Art Deco influence. And I like the plots of both books! So I wouldn't be unhappy if "Radio Girls" won the poll! Lol. Missing the hike means finding a way to earn that particular journey on our own, but I think it was for the best. She's going to miss another meeting tonight, I'm afraid. This time because of illness. Thank you! 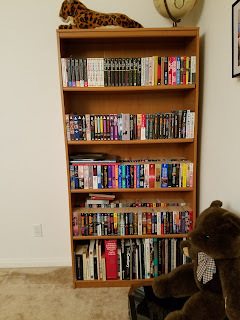 I love that we were able to move into a house where my books would fit. :-) Of course, this after giving up so many of them as it was. Still, I try to make sure books are going out if they are coming in. Except for the very obvious loop hole. E-books. 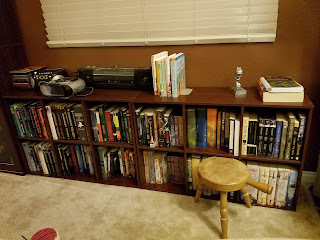 I started reading more on my e-reader about the time we had to move and so have amassed an extensive invisible library now too. I was interested in journalism for a time too. And so I tend to find myself drawn to books featuring journalists. I am well into Radio Girls at the moment and am enjoying it. I do want to read White Collar Girl as well, of course. It sounds like another really good one. I hope you are well, Maria! Thank you for your great comment. I didn't even think about free comic book day yesterday. It looks like you guys did great with it. Sorry that you had a rough week at work. I hope next week is calm for you. I love getting a peek at your bookshelves. I don't really move mine around much either. Have a great week! Carole - Usually I completely miss Free Comic Book Day. I'm not sure why I remembered it this year. Even my husband had forgotten about it until I mentioned it. I hope you are doing well! I went for Radio Girls as it looks a fascinating read. Sorry to hear that work is so grim - it really pulls things down. I do hope things get resolved on Monday. At least you had a fun week-end - the visit to the comic store looked great fun:). I'm so impressed with all your bookshelves and how organised you are - here it's chaotic with our books crammed all over the place. Here's hoping this week turns out a lot better - take care, Wendy:). Sarah - Thank you for voting, Sarah! I am half way through Radio Girls now and am enjoying it. 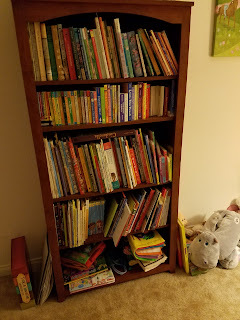 I have spots where books are just crammed in too--in fact, that's often how my daughter's shelves look. I don't even try to organize her books anymore. I just stick them wherever. I hope you are well, Sarah! Free comic book day. What a great idea. My son and I both would have loved that. I hope next week at work is better. Your house is like mine. 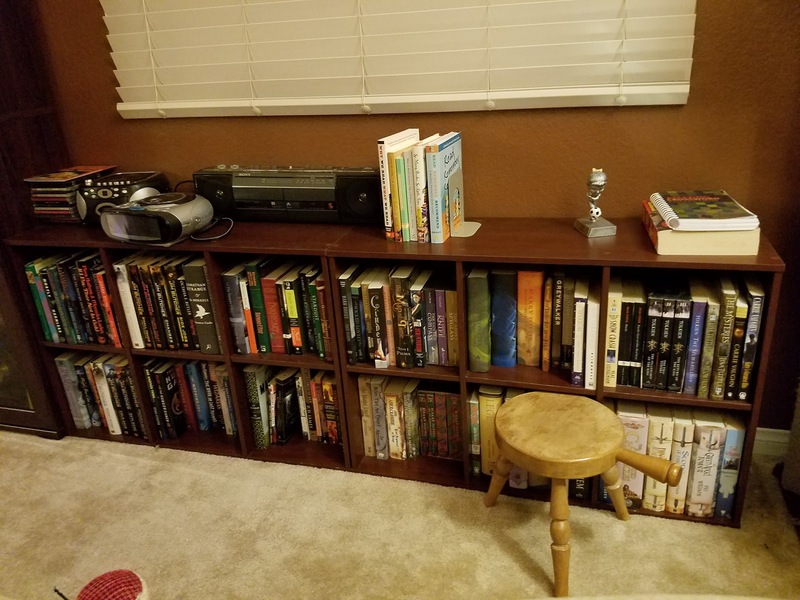 Books in every room! Laura - I hadn't expected they would let us walk out with so many comics at once! I guess it's a thing though. The free comics are specifically printed for the day, country wide (I'm not sure if it's world wide). People come early to get as many as they can--we weren't aiming for that and went at mid-day ourselves. There was one person in costume, but evidently some stores go all out. We didn't get there in time for the cake cutting (and eating). My daughter was disappointed. I didn't even know they would have cake . . . Always love looking at other booklovers' shelves. 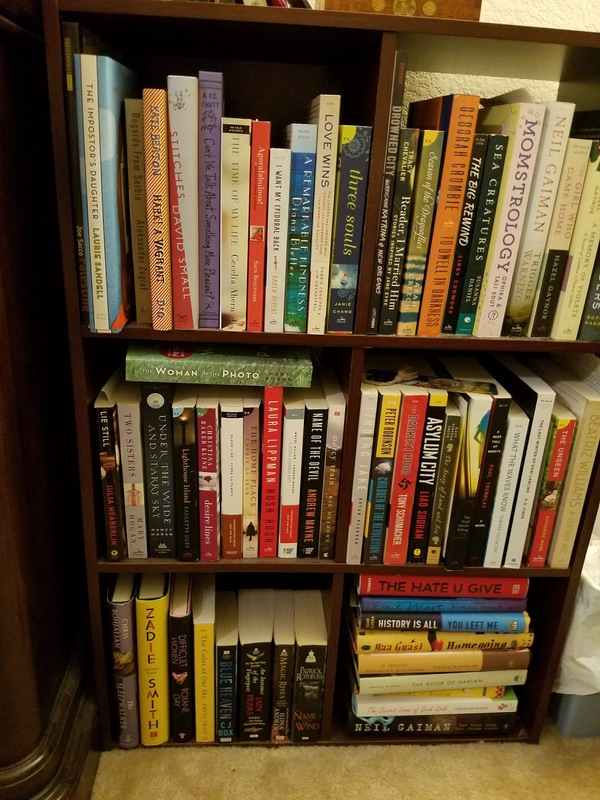 :) I don't rearrange my books unless I'm weeding them. And weeding is a hard thing to do too aside from the rearranging. Not only the work but the sentiments too; there are times I wished I haven't gave away some books but oh well. I LOVE Supernatural and funny you should mention The West Wing as I have nearly finished season 6. I am loving it. Designated Survivor is on my to watch list. Cai - I'm on the fourth season of Supernatural now. I was so excited when Castiel made his appearance for the first time. I am glad you are enjoying West Wing. It's a great show--such good writing. Lark - I hope so too. I used to like work more. But I guess there's always ups and downs with everything. 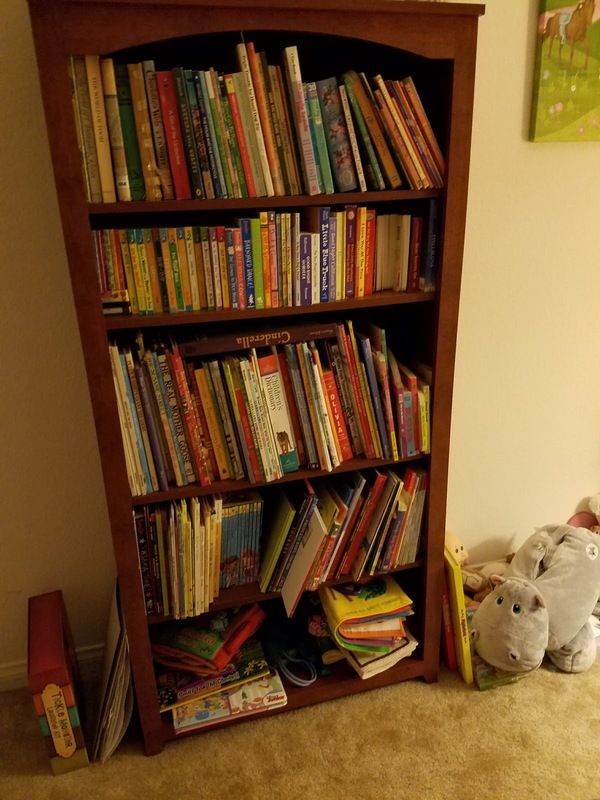 My daughter's books I sometimes organize by size because it's easier. I can't keep her shelves organized regardless to save my life! 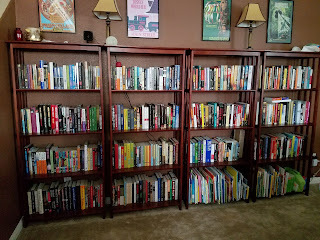 Love the look at your bookshelves! 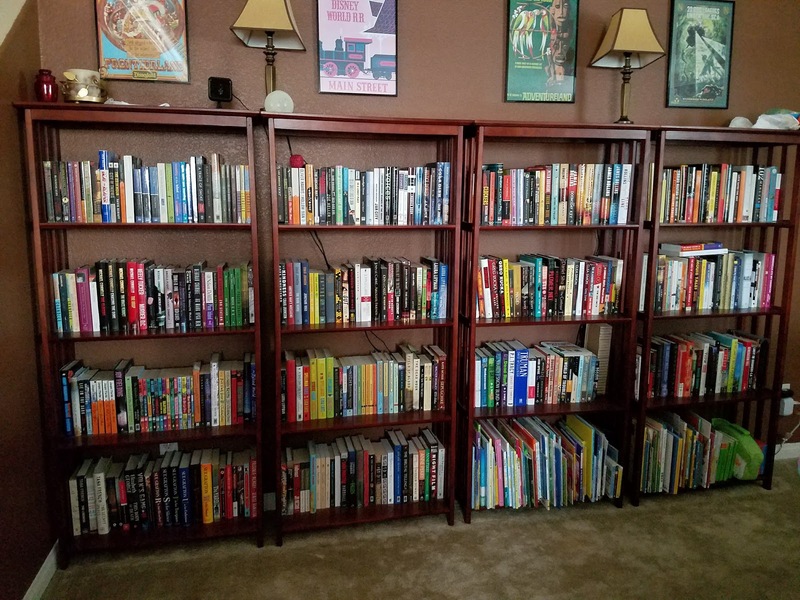 Last week we spent an hour or so rearranging and culling Gage's books and it was fun. I'm hoping that his love for books, even though he continues to struggle with reading, will follow him into adulthood. What a comic book haul! Ohh I love your book self's I am thinking to getting another book shelf, but my mom is set against it. Because if I get another book shelf I will buy more books and than my apartment would really look like an library. 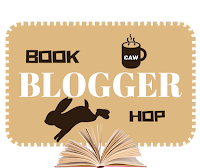 lol life of a book nerd is never easy for me ha ;) Thank you so much for stopping by my blog hop my friend. I voted for Mercer Girls as it sounds really good. I have read a few books with the mail-order bride trope and so far I think I like it. You shelves look awesome and that penguin stuffed animal is adorable!